We don’t notice when our bodies are functioning perfectly. We quickly take for granted that we can walk, talk, move our necks without pain, and eat a meal without a second thought. Many people in this world struggle with physical and mental situations that make simple tasks much more complicated. While there are people born knowing what they face, others develop conditions later in life, making it harder to know how to handle things. 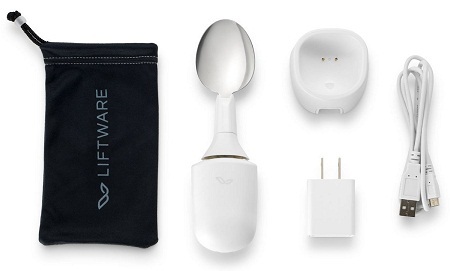 If you have essential tremors or Parkinson’s disease and want to eat meals under less distress, then the Liftware Steady Starter Kit might be able to assist. This has spoon and fork attachments, and stabilizes them despite the shaking from your hand. It was designed to counteract these shakes, and is a relatively new device, but with more support it will likely gain advancements that will lessen the severity of the shake. The handle does appear to be a bit short, though that is likely due to the design that helps maintain stability. Regardless of the pros and cons, this is no small purchase at $199, and you’ll have to purchase the fork attachment separately for an additional $35. It seems as though the plastic housing might give way to breaking after continued use, so purchasing backups to have at the ready would be a wise choice. It’s a lot of cost up front, but you don’t want to wait for ground shipping to be able to eat quickly and effortlessly.